Trainer (The Krabby Kronicle) – From SpongePedia, the biggest SpongeBob-wiki in the world! The Trainer is a dark orange fish that trains Larry the Lobster. He works at the GYM. He is angry at Larry because he found out in The Krabby Kronicle that he was beaten up by Billy. He is orange and has blue pants. 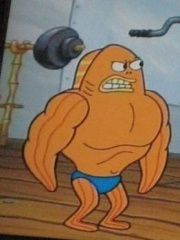 He looks like, Frank (Muscular Goldfish) and is not to be confused with, Coach. This page was last modified on 8 October 2012, at 16:22.